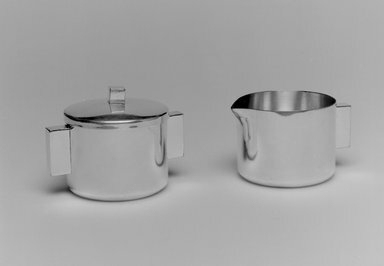 Silver-plated sugar bowl (a) with lid (b). Sugar bowl (a) is a squat cylindrical bowl, slightly rounded at bottom to flat base, straight-edged opening; two attached opposing handles in shape of rectangular blocks. Lid (b) is slightly domed with cube finial fits over top edge of bowl. CONDITION: Good, light scratching and tarnish.